TMPRSS12 (transmembrane protease serine 12) is a 348 amino acid single-pass membrane protein that belong to the peptidase S1 family and contains one peptidase S1 domain. The gene that encodes TMPRSS12 consists of nearly 45,000 bases and maps to human chromosome 12q13.12. Encoding over 1,100 genes within 132 million bases, chromosome 12 makes up about 4.5% of the human genome. A number of skeletal deformities are linked to chromosome 12, including hypochondrogenesis, achondrogenesis and Kniest dysplasia. Noonan syndrome, which includes heart and facial developmental defects among the primary symptoms, is caused by a mutant form of PTPN11 gene product, SH-PTP2. Chromosome 12 is also home to a homeobox gene cluster, which encodes crucial transcription factors for morphogenesis, and the natural killer complex gene cluster, encoding C-type lectin proteins which mediate the NK cell response to MHC I interaction. Trisomy 12p leads to facial development defects, seizure disorders and a host of other symptoms which vary in severity depending on the extent of mosaicism. TMPRSS12 Antibody (N-term) (AP54299PU-N) western blot analysis in NCI-H292 cell line lysates (35 µg/lane). 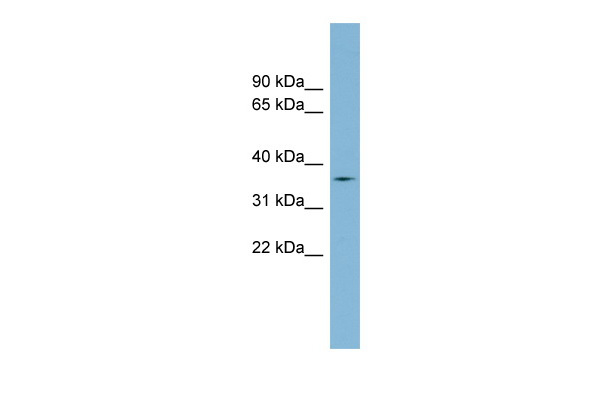 This demonstrates the TMPRSS12 antibody detected the TMPRSS12 protein (arrow).